Every Ismaili yearns to see the Imam of the Time. It’s a dream of a lifetime. Throughout history, past and present, Ismailis have travelled far and wide to earn this special moment of grace and barakah (happiness) in their lives. Since the advent of the 20th century, the 48th Imam, Mawlana Sultan Mahomed Shah, and the current 49th Imam, Mawlana Shah Karim (His Highness the Aga Khan), have graciously travelled to lands around the world to give their beloved murids (followers) this blessed opportunity. Scientific and technological advancements have speeded up and shortened the time-gap between visits of Mawlana Hazar Imam with his jamats, though even in these situations, some jamats such as those living in Central Asia, did not have the opportunity of a meeting with the present Imam and his predecessors for decades and centuries. What sustained their faith, sometimes under extremely difficult and extra ordinary circumstances, was their spiritual bond with the Imam of the Time. His Highness the Aga Khan pictured amongst his followers in Badakhshan in May 1995. The following collection of writings from Ismaili history articulates the importance of both the physical as well as the spiritual glimpse of the Imam of the Time. Our next reading in this short four-part series to commemorate Mawlana Hazar Imam’s 58th Imamat Day will consist of excerpts from the writings of Ismaili Imams on the subject of Imamat. This will be followed by contemporary voices on Imamat by members of the jamat. A folio from the manuscript of al-Shirazi’s Sirat. Credit: The Institute of Ismaili Studies. “I tried to speak but my tongue refused to move. People asked me to say what I wished to say. I could say nothing. The Imam said, ‘Leave him. Let his fear and awe subside’. “Greetings! O Emperor of the Realm of Faith and World; I come from Khurasan to behold your face. All I have is a soul imperfect, sins and transgressions galore. “Despite such worthless goods, I long for your grace, hoping that through me you may forgive the trespasses of your servants-one and all. “As you are the sovereign and governor of all creation, this being testified to by the Qur’an itself, your proper name has been made manifest to all the faithful. Folio of Pir Sadr al-Din’s Saloko Nano at the Institute of Ismaili Studies. “Friend! None but a few know of the exalted station. Indeed, they alone recognize it who have found the true guide. “Friend! Within the heart, at the confluence of the three spiritual rivers, there is an imperishable light. There – a shimmering effulgence, pearls are showered. “Friend! I completely lost consciousness of my physical self when my meditation mounted the empyrean, bursting forth. “Friend! I beheld the place of the lofty throne, I saw the seven islands, the nine continents. “Friend! The religious scriptures and books cannot fathom this, for there is neither day there, nor night, neither sun, nor shade. “Friend! My Lord is not such that He can be spoken of. He is to be seen – for He is indescribable, and nameless. “O Brother, The True Preceptor is like the philosopher’s stone and the followers are like copper. “When the copper comes in contact with the philosopher’s stone it becomes gold. “Salvation is to be found in the Imam of the Time. “Ever since I found the Imamate, permanently in human form, I have known no other guide than the living, everlasting Imam. “For in his command, I have found peace in both the worlds. “One after the other, there follows another Qaim Imam Ali. Date posted: July 8, 2015. Readings adapted from The Life and Lectures of the Grand Missionary al-Muayyad-fid-Din al-Shirazi and The Ismailis in the Middle Ages: A History of Survival, a Search for Salvation by Shafique N. Virani, Hardcover, May 3, 2007. Feedback welcome, please click Leave a comment. Canada’s Confederation Day, the American Independence Day, Tanzania’s Saba Saba celebrations and the Imamat Day of His Highness the Aga Khan, all fall in the month of July. Canada is already preparing for its 150th birthday two years hence when Ismailis around the world will, inshallah, celebrate the Diamond Jubilee of their beloved 49th Imam, whom they respectfully address as Mawlana Hazar Imam. A portrait of Mawlana Hazar Imam, His Highness Prince Karim Aga Khan, with a framed portrait of Mawlana Sultan Mahomed Shah in the background. Photo by Philippe Le Tellier/Paris Match via Getty Images. Copyright. His Highness the Aga Khan succeeded to the 49th hereditary throne of Imamat at the age of twenty by the will of his grandfather, Mawlana Sultan Mahomed Shah, His Highness the Aga Khan III, who served as the 48th Ismaili Imam for a record 71 years (August 17, 1885 – July 11, 1957). Over the next week, Simerg will provide an insight into the principles of Imamat through short readings. We begin the series by posting the Preamble of the Ismaili Constitution, which is an introductory succinct statement giving the historical roots of the Ismaili Imamat, the principle of Imamat succession, and the permanency of the spiritual bond that exists between the Imam and his followers. Another theme that will be explored in the coming few days through the writings of Ismaili Pirs, missionaries and philosophers is the principle of the Unity of Imamat, that is the Ismaili belief and understanding that each Imam, being the bearer of the Noor (Light) of Imamat, is the same irrespective of his own age or the time he lives in. December 13, 1986, Geneva: On his 50th birthday, His Highness the Aga Khan is seen ordaining a new constitution for the worldwide Ismaili community. In 1905, the 48th Ismaili Imam, Sir Sultan Muhammad Shah, His Highness the Aga Khan III, issued a written set of ‘Rules and Regulations’ for the Ismailis of East Africa which effectively served as their communal constitution. This constitution re-affirmed the centrality of the Imam’s authority over the affairs of his community and also articulated the distinctive religious identity of the Ismailis. This document was revised and published several times until 1954, and was made available to Ismailis and non-Ismailis alike. Similar rules were given to the Ismaili community in British India. During the 1960’s, the 48th Imam’s grandson and successor, Mawlana Shah Karim al-Hussaini Hazar Imam, His Highness the Aga Khan IV, gave Constitutions to his followers in Africa and Pakistan in 1962, and to the Jamat in India in 1967. The Ismaili Constitution became applicable throughout the world, linking all Ismailis to the Imamat. His Highness did this with the belief that the Constitution would provide a strong institutional and organizational framework through which his community would be able to contribute to the harmonious development of the Muslim Ummah and of the societies in which his followers lived. He expressed confidence that the Ismaili Constitution would give a stronger integrated identity to his community, and that in abiding by it in letter and spirit, the Ismailis would achieve greater peace, unity, happiness, security and wellbeing. He futher hoped that the Constitution would become an enabling document for all his murids (followers) for an active role in institution building, for creative application of their abilities, for personal development and for intellectual and spiritual satisfaction. 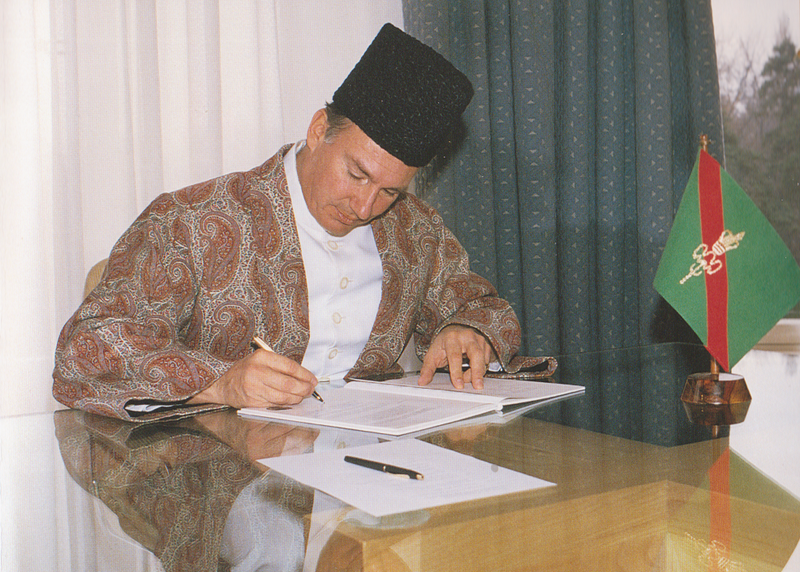 The new constitution was ordained, signed and sealed by Mawlana Hazar Imam on December 13th, 1986, his fiftieth Salgirah (birthday) and thirtieth year of Imamat. The Constitution was revised by Mawlana Hazar Imam on July 11, 1998, when he completed forty one years of his spiritual leadership. (A) The Shia Imami Ismaili Muslims affirm the shahādah lā ilāha illa-llāh, Muhammadur rasulu-llāh, the Tawhid therein and that the Holy Prophet Muhammad (s.a.s.) is the last and final Prophet of Allah. Islam, as revealed in the Holy Quran, is the final message of Allah to mankind, and is universal and eternal. The Holy Prophet (s.a.s.) through the divine revelation from Allah prescribed rules governing spiritual and temporal matters. (B) In accordance with Shia doctrine, tradition, and interpretation of history, the Holy Prophet (s.a.s.) designated and appointed his cousin and son-in-law Hazrat Mawlana Ali Amiru-l-Mu’minin (a.s), to be the first Imam to continue the Ta’wīl and Ta‘līm of Allah’s final message and to guide the murids, and proclaimed that the Imamat should continue by heredity through Hazrat Mawlana Ali (a.s) and his daughter Hazrat Bibi Fatimat-az-Zahra, Khātun-i-Jannat (a.s). (C) Succession of Imamat is by way of Nass, it being the absolute prerogative of the Imam of the time to appoint his successor from amongst any of his male descendents whether they be sons or remoter issue. (D) The authority of the Imam in the Ismaili Tariqah is testified by Bay‘ah by the murid to the Imam which is the act of acceptance by the murid of the permanent spiritual bond between the Imam and the murid. This allegiance unites all Ismaili Muslims worldwide in their loyalty, devotion and obedience to the Imam within the Islamic concept of universal brotherhood. It is distinct from the allegiance of the individual murid to his land of abode. (E) From the time of the Imamat of Hazrat Mawlana Ali (a.s), the Imams of the Ismaili Muslims have ruled over territories and peoples in various areas of the world at different periods of history and, in accordance with the needs of the time, have given rules of conduct and constitution in conformity with the Islamic concepts of unity, brotherhood, justice, tolerance and goodwill. (F) Historically and in accordance with Ismaili tradition, the Imam of the time is concerned with spiritual advancement as well as improvement of the quality of life of his murids. The imam’s ta‘lim lights the murid’s path to spiritual enlightenment and vision. In temporal matters, the Imam guides the murids, and motivates them to develop their potential. (G) Mawlana Hazar Imam Shah Karim al Hussaini, His Highness Prince Aga Khan, in direct lineal descent from the Holy Prophet (s.a.s.) through Hazrat Mawlana Ali (a.s.) and Hazrat Bibi Fatima (a.s), is the Forty-Ninth Imam of the Ismaili Muslims. (H) By virtue of his office and in accordance with the faith and belief of the Ismaili Muslims, the Imam enjoys full authority of governance over and in respect of all religious and Jamati matters of the Ismaili Muslims. (I) It is the desire and Hidāyat of Mawlana Hazar Imam that the constitutions presently applicable to the Ismaili Muslims in different countries be superseded and that the Ismaili Muslims worldwide be given this constitution in order better to secure their peace and unity, religious and social welfare, to foster fruitful collaboration between different peoples, to optimise the use of resources, and to enable the Ismaili Muslims to make a valid and meaningful contribution to the improvement of the quality of life of the Ummah and the societies in which they live. Date posted: Saturday, July 4, 2015. We welcome feedback/letters from our readers. Please click Leave a comment. Your feedback may be edited for length and brevity, and is subject to moderation. We are unable to acknowledge unpublished letters. Please Sign-up for blog subscription at top right of this page. (1) The Ismailis: An Illustrated History by Farhad Daftary and Zulfikar Hirji, published by Azimuth editions in association with The Institute of Ismaili Studies (2008). (3) http://www.kamalzar.com, website of Alwaez Kamaluddin Muhammad and Alwaeza Zarina Kamaludin. Please click for Imam Ja’far al-Sadiq’s Orations. 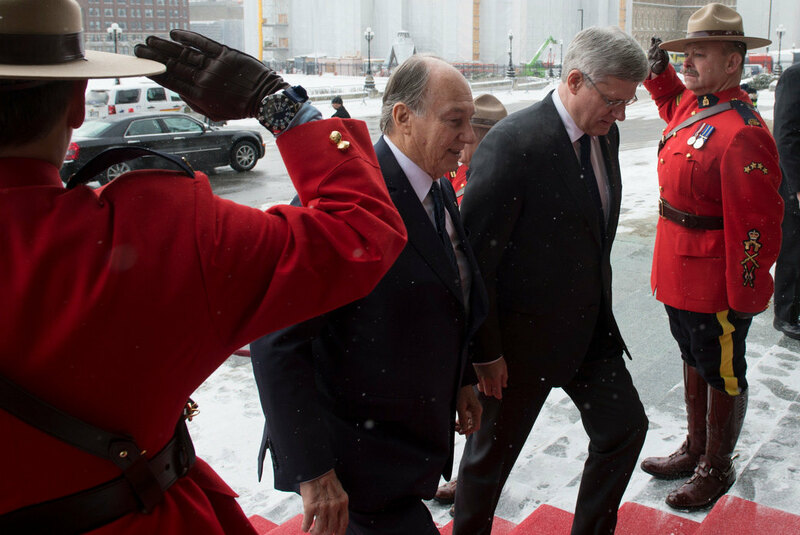 His Highness the Aga Khan and Prime Minister Stephen Harper walk the Hall of Honour at the Parliament of Canada. where His Highness delivered an address to both the Houses on Thursday, February 27, 2014. This impressive ceremonial hall is used for state occasions, parliamentary events, and formal processions such as the Speaker’s Parade. The Hall of Honour is part of the central axis of the Centre Block, joining Confederation Hall to the Library of Parliament, and providing access to the main committee rooms. Photo credit: The Office of the Prime Minister of Canada. 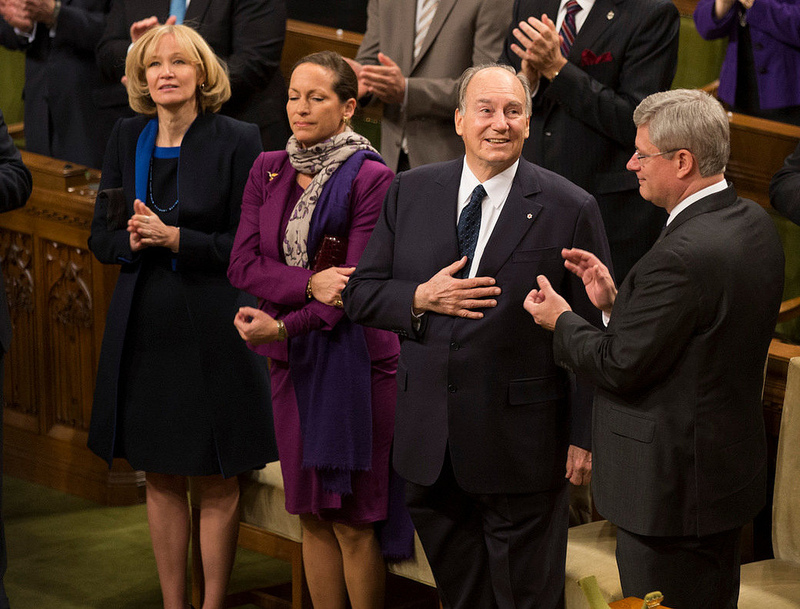 His Highness the Aga Khan is applauded by the Prime Minister, Members of the House, as well as other distinguished visitors as he arrives in the House of Commons on Thursday, February 27, 2014 to deliver a rare address – the first by a faith leader in 75 years. The Ottawa Citizen published a similar photo on its front page of Friday February 28, giving it the title “In Divine Company.” Alongside the Ismaili Imam are his daughter Princess Zahra and the Prime Minister’s wife, Laureen Harper. 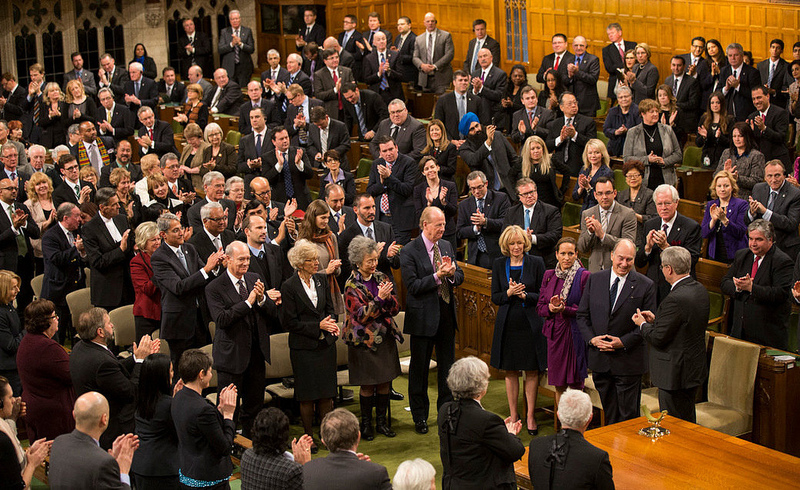 Others in the photo, in rows adjacent to Mrs. Harper (l to r) — 1st row: The Aga Khan’s younger brother, Prince Amyn Muhammad Aga Khan, Chief Justice of the Supreme Court of Canada, The Right Honourable Beverly McLachlin, Former Governor General of Canada, The Right Honourable Adrienne Clarkson, and renowned Canadian author, intellectual and philosopher, John Ralston Saul; 2nd row (l to r). 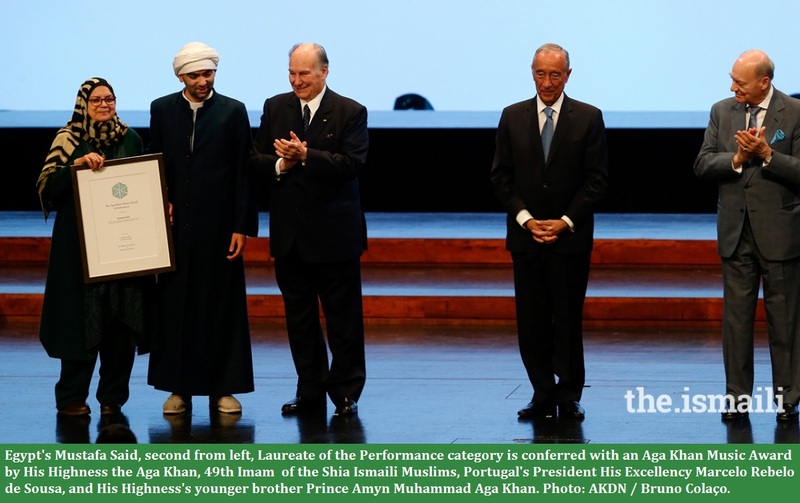 President Malik Talib of the Aga Khan Ismaili Council for Canada, Prince Hussain Aga Khan, Princess Salwa Aga Khan and her husband Prince Rahim Aga Khan – with both the Princes in the row being the Aga Khan’s children. Photo credit: The Office of the Prime Minister of Canada. I propose today to give you some background about myself and my role, and then to reflect about what we call the Ummah — the entirety of Muslim communities around the world. I will comment, as a faith leader, on the crisis of governance in so much of the world today, before concluding with some thoughts about the values that can assist countries of crisis to develop into countries of opportunity, and how Canada can help shape that process. First then, a few personal words. I was born into a Muslim family, linked by heredity to the Prophet Muhammad (may peace be upon him and his family). My education blended Islamic and Western traditions, and I was studying at Harvard some 50 years ago (yes 50 years ago — actually 56 years ago!) when I became the 49th hereditary Imam of the Shia Imami Ismaili Muslims. 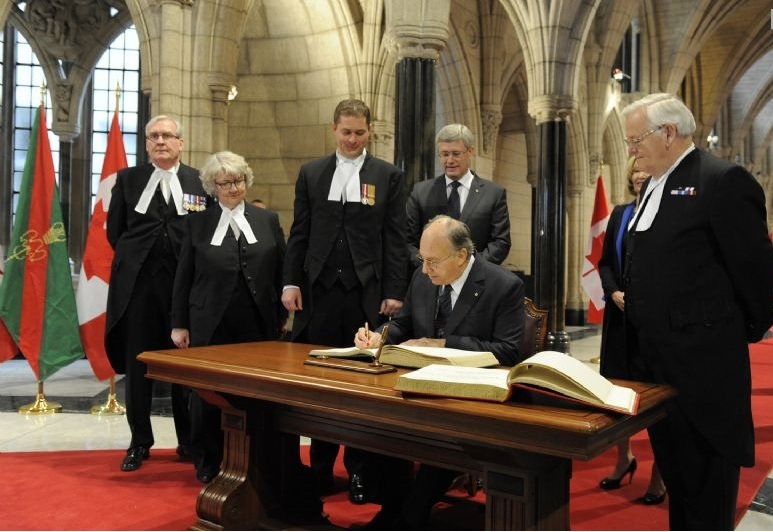 His Highness the Aga Khan at the Canadian Parliament on Thursday, February 27, 2014. Photo: Copyright Jean-Marc Carisse. The Ismaili Imamat is a supra-national entity, representing the succession of Imams since the time of the Prophet. But let me clarify something more about the history of that role, in both the Sunni and Shia interpretations of the Muslim faith. The Sunni position is that the Prophet nominated no successor, and that spiritual-moral authority belongs to those who are learned in matters of religious law. As a result, there are many Sunni imams in a given time and place. But others believed that the Prophet had designated his cousin and son-in-law, Ali, as his successor. From that early division, a host of further distinctions grew up — but the question of rightful leadership remains central. In time, the Shia were also sub-divided over this question, so that today the Ismailis are the only Shia community who, throughout history, have been led by a living, hereditary Imam in direct descent from the Prophet. The role of the Ismaili Imam is a spiritual one; his authority is that of religious interpretation. It is not a political role. I do not govern any land. At the same time, Islam believes fundamentally that the spiritual and material worlds are inextricably connected. Faith does not remove Muslims — or their Imams — from daily, practical matters in family life, in business, in community affairs. Faith, rather, is a force that should deepen our concern for our worldly habitat, for embracing its challenges, and for improving the quality of human life. 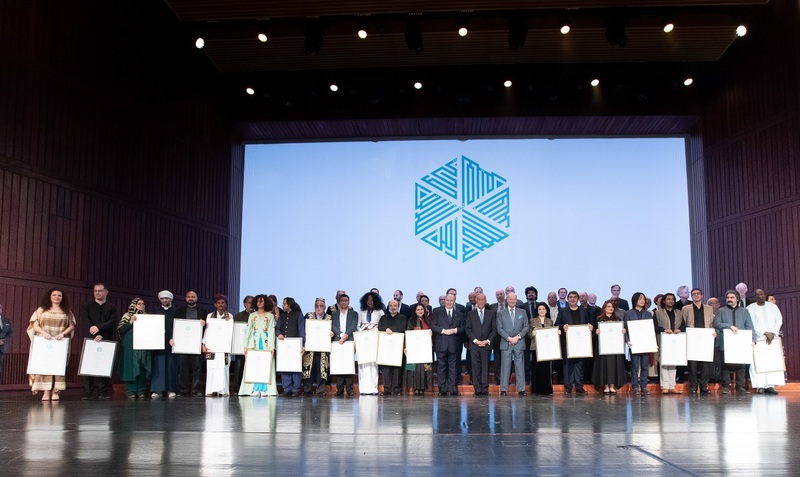 This Muslim belief in the fusion of Faith and World is why much of my attention has been committed to the work of the Aga Khan Development Network. 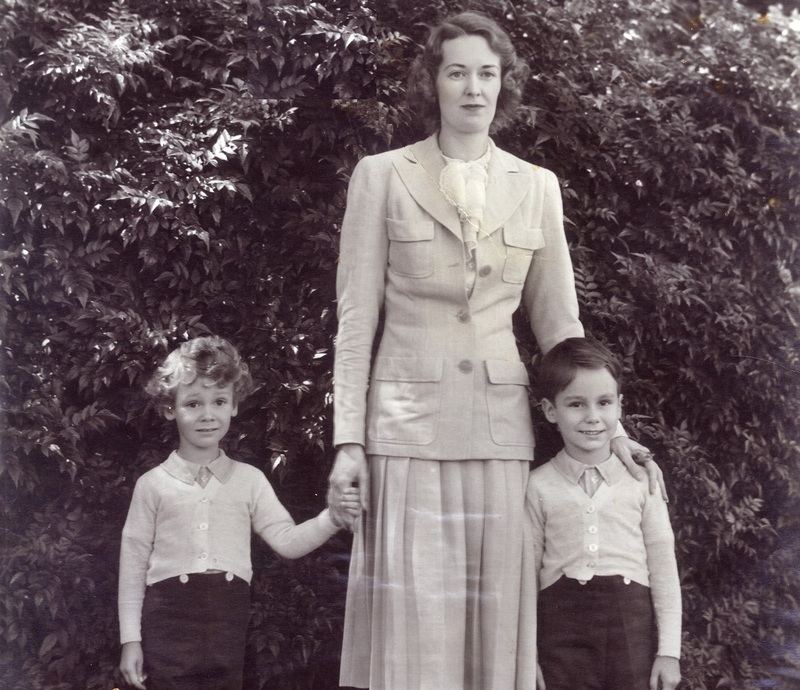 In 1957, when I succeeded my grandfather as Imam, the Ismaili community lived for the most part in the colonies or ex-colonies of France, Belgium and the British Empire, or behind the Iron Curtain. They are still a highly diverse community, in terms of ethnicity, language, culture, and geography. They continue to live mostly in the developing world, though increasing numbers now live in Europe and North America. Before 1957, individual Ismaili communities had their own social and economic institutions where that was allowed. There was no intent for them to grow to national prominence, and even less a vision to coordinate their activities across frontiers. Today, however, that situation has changed, and the Aga Khan Development Network has a strong presence in several dozen countries, where appropriate regional coordination is also useful. The AKDN — as we call it — is composed of a variety of private, non-governmental, non-denominational agencies implementing many of the Imamat’s responsibilities….Most of our AKDN activities have been born from the grass-roots of developing countries, reflecting their aspirations and their fragilities. Through the years, of course, this landscape has changed fundamentally, with the creation of new states like Bangladesh, the horrors of ethnic cleansing in Uganda, the collapse of the Soviet empire and the emergence of new countries with large Ismaili populations such as Tajikistan. More recently, of course, we have faced the conflicts in Afghanistan and Syria. 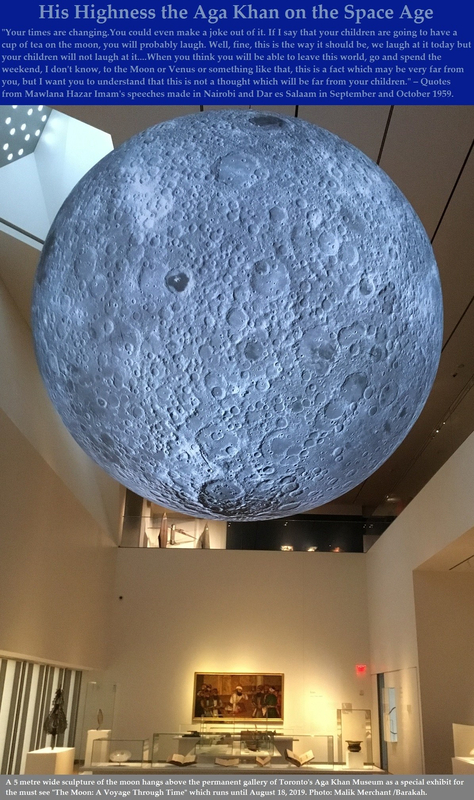 But through all of these experiences, the Ismaili peoples have demonstrated an impressive capacity to persevere and to progress. Our work has always been people-driven. It grows out of the age-old Islamic ethic, committed to goals with universal relevance: the elimination of poverty, access to education, and social peace in a pluralist environment. The AKDN’s fundamental objective is to improve the quality of human life. Amongst the great common denominators of the human race is a shared aspiration, a common hope, for a better quality of life. I was struck a few years ago to read about a UNDP survey of 18 South American states where the majority of the people were less interested in their forms of government, than in the quality of their lives. Even autocratic governments that improved their quality of life would be more acceptable for most of those polled than ineffective democratic governments. I cite that study, of course, with due respect to governmental institutions that have had a more successful history — including certain very distinguished parliaments! But the sad fact behind so much instability in our world today is that governments are seen to be inadequate to these challenges. A much happier fact is that, in the global effort to change this picture, Canada is an exemplary leader. 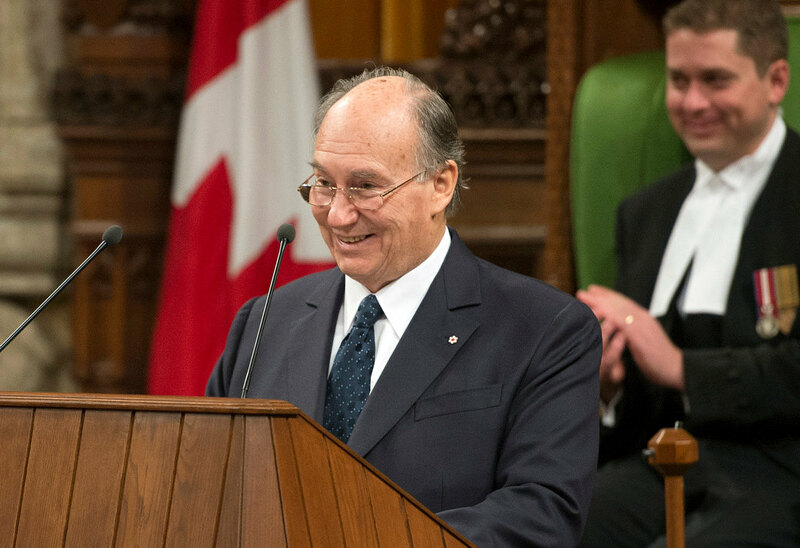 His Highness the Aga Khan seen smiling in a lighter moment during his address to both the Houses of the Canadian Parliament on Thursday, February 27, 2014. Referring to the two gold medals won by the Canadian hockey teams in the Sochi Olympics, the Ismaili Imam remarked, “As an ex-player myself I was hoping you would require your honorary citizens to join your team. I am convinced that the Dalai Lama and I would have been a formidable defence.” Photo credit : The Office of the Prime Minister of Canada. One of our earliest collaborations was to establish the first private nursing school in Pakistan, in cooperation with McMaster and the CIDA of that time. It was the first component of the Aga Khan University — the first private university in that country. The nursing school’s impact has been enormous; many of those who now head other nursing programmes and hospitals in the whole of the region — not just Pakistan — are graduates of our school. Canada was also one of the first donors to the Aga Khan Rural Support Programme in Northern Pakistan, tripling incomes in this remote, marginalised area…. I could speak about our close ties with Canadian universities also, such as McMaster, McGill, the University of Toronto, and the University of Alberta, enhancing our own institutions of tertiary education — the Aga Khan University and the University of Central Asia. The latter institution has resulted from the Imamat’s unique, tripartite treaty with the governments of Kazakhstan, Kyrgyzstan and Tajikistan. It serves some 22 million people who live in Central Asia, in hillside and high mountain environments, areas of acute seismic and economic vulnerability. I could list many more examples in cultural development and in scientific research. And we are especially proud of the Global Centre for Pluralism here in Ottawa, a joint project of the Imamat and the Canadian government. In just three years, Canada will mark its 150th anniversary, and the whole world will be ready to celebrate with you. Sharing Canada’s robust pluralistic history, is a core mission of our Global Centre, and 2017 will be a major opportunity for doing so, operating from its headquarters in the former War Museum on Sussex Drive. Perhaps 2017 and the celebrations can be a catalyst with our neighbours to improve the entire riverfront area around that building. Our partnership in Canada has been immensely strengthened, of course, by the presence for more than four decades of a significant Ismaili community. Like most historic global communities the Ismaili peoples have a variegated history, but surely our experience in Canada has been a particularly positive chapter. His Highness the Aga Khan signs the visitors books for the House of Commons and the Senate in the Canadian Parliament Rotunda as Prime Minister Stephen Harper, his wife Laureen Harper, The Honourable Andrew Scheer, Speaker of the House of Commons and the Honourable Noël Kinsella, Speaker of the Senate, and other individuals look on. Photo credit: TheIsmaili/Gary Otte. We are deeply pleased that we can sign today a new Protocol with your Government — further strengthening our ongoing platform for cooperation. As we look to the next 25 years of the AKDN, we believe that our permanent presence in the developing world will make us a dependable partner, especially in meeting the difficult challenges of predictability. Against this background, let me move on to the broad international sphere, including the role of relations between the countries and cultures of Islam — what we call the Ummah — and non-Islamic societies. It is central to the shape of global affairs in our time. I would begin by emphasising a central point about the Ummah often unseen elsewhere: the fundamental fact of its immense diversity. Muslim demography has expanded dramatically in recent years, and Muslims today have highly differing views on many questions. Essential among them is that they do not share some common, overarching impression of the West. It has become commonplace for some to talk about an inevitable clash of the industrial West and Islamic civilizations. But Muslims don’t see things in this way. Those whose words and deeds feed into that point of view are a small and extreme minority. For most of us, it is simply not true. We find singularly little in our theological interpretations that would clash with the other Abrahamic faiths — with Christianity and Judaism. Indeed, there is much that is in profound harmony. Today, these Islamic traditions have been obscured in many places, from Muslims and non-Muslims alike. A depiction of the Aga Khan Museum and the Ismaili Centre which are nearing completion in Toronto, Canada. The work of the Aga Khan Trust for Culture….is to revive the memory of this inclusive inheritance. Another immediate initiative is the Aga Khan Museum which will open this year in Toronto, an important testimonial in a Canadian setting to the immense diversity of Islamic cultures. Perhaps the most important area of incomprehension, outside the Ummah, is the conflict between Sunni and Shia interpretations of Islam and the consequences for the Sunni and Shia peoples. This powerful tension is sometimes even more profound than conflicts between Muslims and other faiths. It has increased massively in scope and intensity recently, and has been further exacerbated by external interventions. In Pakistan and Malaysia, in Iraq and Syria, in Lebanon and Bahrain, in Yemen and Somalia and Afghanistan it is becoming a disaster. It is important, therefore, for non-Muslims who are dealing with the Ummah to communicate with both Sunni and Shia voices. To be oblivious to this reality would be like ignoring over many centuries that there were differences between Catholics and Protestants, or trying to resolve the civil war in Northern Ireland without engaging both Christian communities. What would have been the consequences if the Protestant-Catholic struggle in Ireland had spread throughout the Christian world, as is happening today between Shia and Sunni Muslims in more than nine countries? It is of the highest priority that these dangerous trends be well understood and resisted, and that the fundamental legitimacy of pluralistic outlooks be honoured in all aspects of our lives together — including matters of faith. By Civil Society I mean an array of institutions which operate on a private, voluntary basis, but are motivated by high public purposes. They include institutions devoted to education, culture, science and research; to commercial, labor, ethnic and religious concerns; as well as professional societies in law, accounting, banking, engineering and medicine. Civil Society encompasses groups that work on health and safety and environmental matters, organisations that are engaged in humanitarian service, or in the arts or the media. 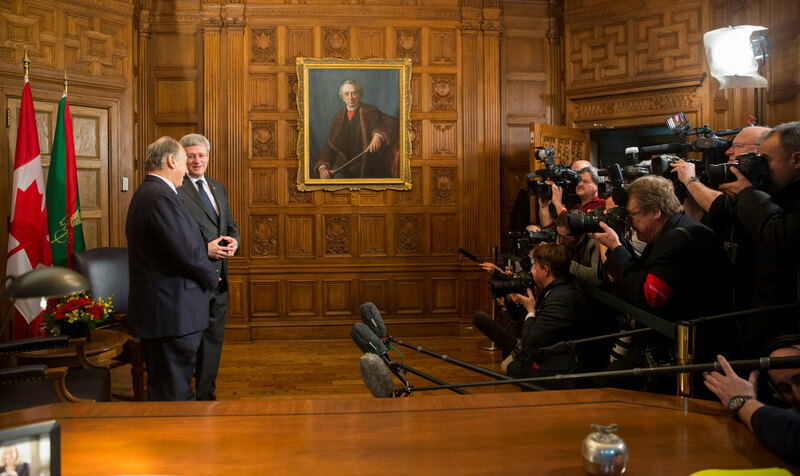 His Highness the Aga Khan and Prime Minister Harper in a conversation as they proceed to the signing ceremony of the protocol of understanding between the Ismaili Imamat and Canada. They are flanked on either side by the red and green flag of the Ismaili Imamat and the maple leaf flag of Canada. Photo: Jean-Marc Carisse. Copyright. We see it expanding in many places, from Sub-Saharan Africa to Tunisia and Egypt, from Iran to Bangladesh. At a time of extreme danger in Kenya a few years ago — the beginnings of a civil war — the former Secretary-General of the United Nations, Kofi Annan, led the way to a peaceful solution which rested heavily on the strength of Kenya’s Civil Society. Increasingly, I believe, the voices of Civil Society are voices for change, where change has been overdue. They have been voices of hope for people living in fear. They are voices that can help transform countries of crisis into countries of opportunity. There are too many societies where too many people live in a culture of fear, condemned to a life of poverty. Addressing that fear, and replacing it with hope, will be a major step to the elimination of poverty. And often the call for hope to replace fear will come from the voices of Civil Society. I believe that Canada is uniquely able to articulate and exemplify three critical underpinnings of a quality Civil Society — a commitment to pluralism, to meritocracy, and to a cosmopolitan ethic. A cosmopolitan ethic is one that welcomes the complexity of human society. It balances rights and duties, freedom and responsibility. It is an ethic for all peoples, the familiar and the Other, whether they live across the street or across the planet. Quality education is fundamental to the development of a meritocratic Civil Society, and thus to the development of pluralistic attitudes. The history of Canada has a great deal to teach us in this regard, including the long, incremental processes through which quality civil societies and committed cultures of pluralism are built. One of the watchwords of our new Global Centre for Pluralism is that “Pluralism is a Process and not a Product.” I know that many Canadians would describe their own pluralism as a “work in progress,” but it is also an asset of enormous global quality. The Old Canadian War Museum will become the future site of the Global Centre for Pluralism, once renovations are completed inside the building. 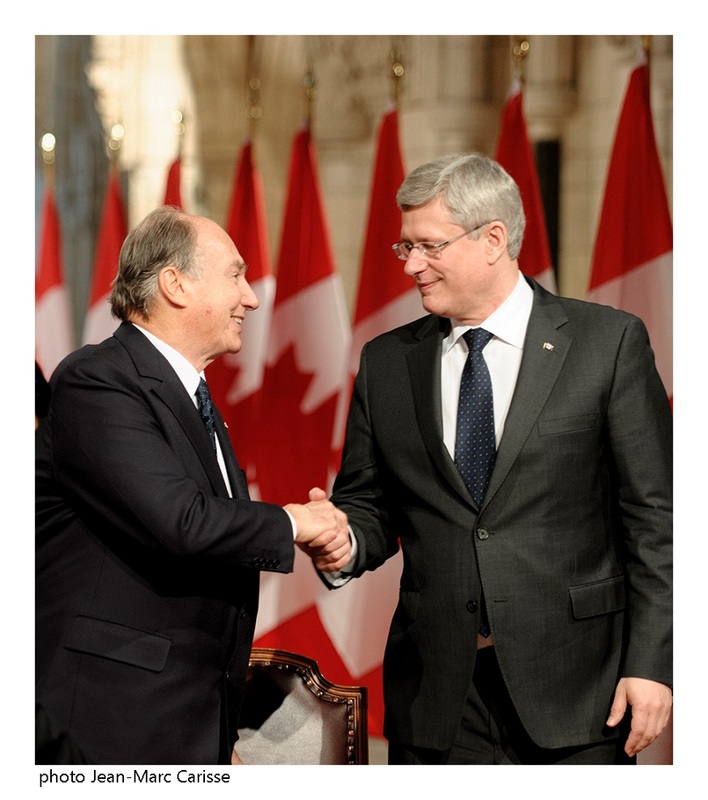 The Centre is governed by an international Board of Directors chaired by His Highness the Aga Khan. The Global Centre for Pluralism was inspired by the example of Canada’s inclusive approach to citizenship, and works to advance respect for diversity worldwide, believing that openness and understanding toward the cultures, social structures, values and faiths of other peoples are essential to the survival of an interdependent world. What more will a quality Civil Society now require of us? Sadly, the world is becoming more pluralist in fact, but not necessarily in spirit. “Cosmopolitan” social patterns have not yet been matched by “a cosmopolitan ethic.” In fact, one harsh reality is that religious hostility and intolerance seems to be on the rise in many places — from the Central African Republic, to South Sudan, to Nigeria, to Myanmar, the Philippines and other countries — both between major religious groups and within them. Again, Canada has responded in notable ways, including the establishment — just one year ago — of the Office of Religious Freedom. Its challenges, like those facing the Centre for Global Pluralism, are enormous and its contributions will be warmly welcomed. And surely it will also serve as a worthy model for other countries. In sum, I believe that Civil Society is one of the most powerful forces in our time, one that will become an increasingly universal influence, engulfing more countries, influencing, reshaping and sometimes even replacing ineffective regimes. And I also believe that Civil Society around the world should be vigorously encouraged and wisely nurtured by those who have made it work most successfully — Canada first amongst all. The Aga Khan Development Network has worked over five decades to assist in the enhancement of Civil Society. And as we look to its future, we are honoured that Canada views us as a valued partner. Thank you Prime Minister. One key to Canada’s success in building a meritocratic Civil Society is your recognition that democratic societies require more than democratic governments. 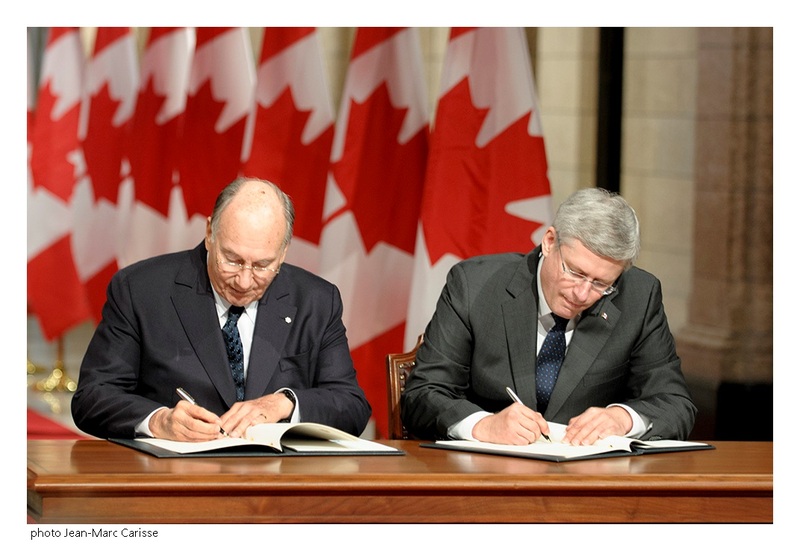 His Highness the Aga Khan and Prime Minister Stephen Harper sign a Protocol of Understanding further strengthening the ongoing platform of cooperation between the Ismaili Imamat and Canada. Photo: Jean-Marc Carisse. Copyright. During my Golden Jubilee — and this is important — six years ago Ismailis from around the world volunteered their gifts, not only of wealth, but most notably of time and knowledge, in support of our work. We established a Time and Knowledge framework, a structured process for engaging an immense pool of expertise involving tens of thousands of volunteers. Many of them traveled to developing countries as part of this outpouring of service — one third of those were Canadians. Their impact has been enormous in helping us to achieve best practice standards in our institutions and programmes, making us we hope an even better partner for Canada! The Aga Khan University in Karachi and East Africa are expanding to create a new Liberal Arts faculty, and to establish eight new post-graduate schools in collaboration with several Canadian universities. We also share with Canada a deep appreciation for the potential of early childhood education. It is the period of the greatest development of the brain. This education is one of the most cost-effective ways to improve the quality of life for rural as well as urban populations. Congratulations, Prime Minister, for your initiative on this. In this regard, let me take a moment to salute the late Dr Fraser Mustard, whose work in Early Childhood Development will impact millions of people around the world. The AKDN has been fortunate to have been inspired and counselled by this great Canadian scientist and humanist. 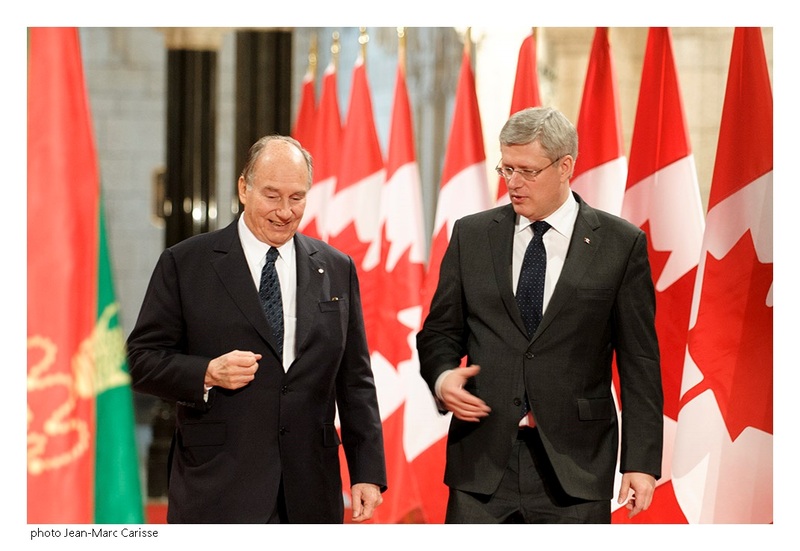 His Highness the Aga Khan and Prime Minister Stephen Harper congratulate each other after signing a Protocol of Understanding between the Ismaili Imamat, a 1400 year hereditary Institution, and Canada. Photo: Jean-Marc Carisse. Copyright. I am most grateful to the Prime Minister and to you who have given me this opportunity to share — from a faith perspective — some of the issues that preoccupy me when looking ahead. I hope I have explained why I am convinced about the global validity of our partnership for human development. 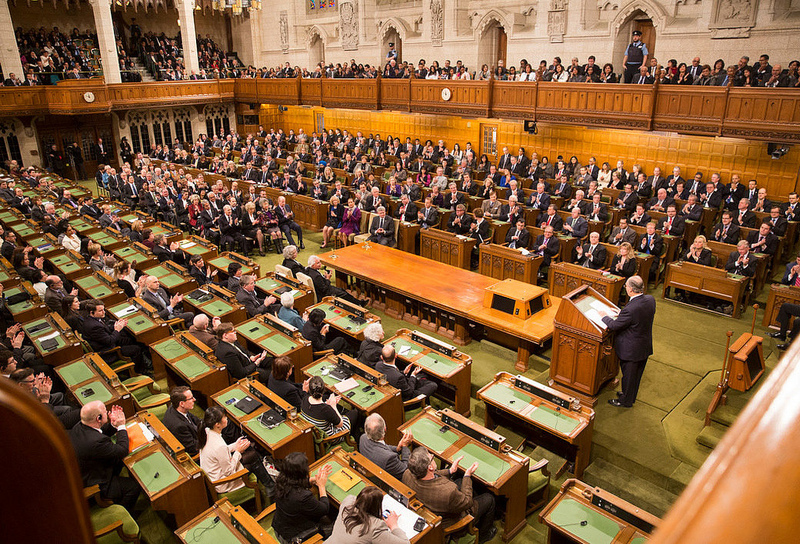 His Highness the Aga Khan seen addressing at the House of Commons Chambers to both the houses of Canadian Parliament on Thursday, February 27, 2014. Photo credit: The Office of the Prime Minister of Canada. I know of no more beautiful expression about the unity of our human race — born indeed from a single soul. Date posted: Saturday, March 1, 2014. Copyright. 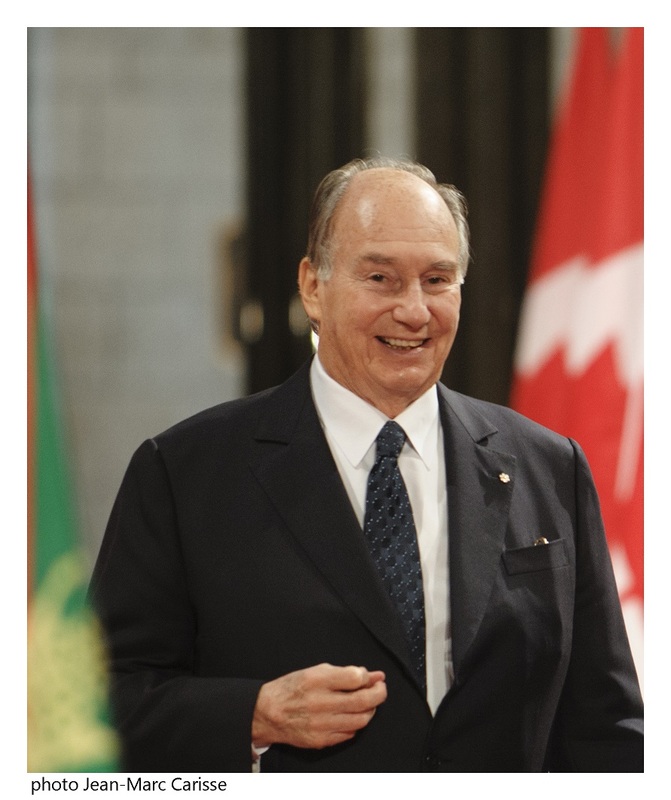 For non-comparable referral links to all things Ismaili as well as material about His Highness the Aga Khan’s recent official visit to Canada, please visit ismailimail. For past and recent speeches of Ismaili Imams please visit www.nanowisdoms.org.